3 On Camps Bay Boutique Hotel - Camps Bay Accommodation. 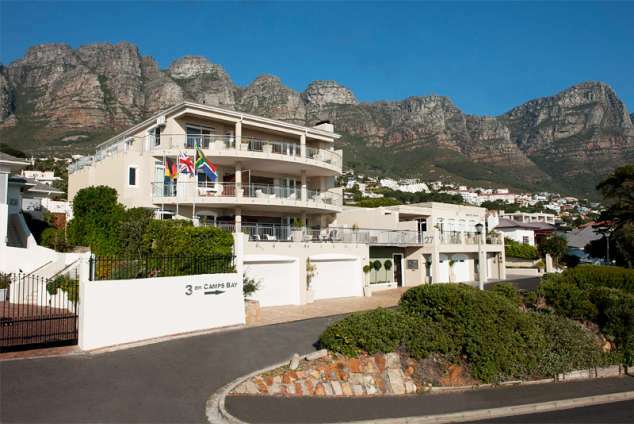 3 On Camps Bay is a luxury 16 bedroom Guesthouse/ Boutique Hotel in the up-market and trendy Camps Bay, Cape Town. Located in a cul-de-sac overlooking the Atlantic Ocean, 3 On Camps Bay offers a quiet retreat where you can vacation in the utmost luxury and pampered style. From the airport you drive directly onto the N2 Highway, following the City/Cape Town signs. Drive along the N2 Highway following the Sea Point/Waterfront signs till you come to traffic lights which is the end of the highway. Carry on driving straight up Buitengracht Street following the Camps Bay/Table Mountain Cable Car signs. Buitengracht becomes Kloof Nek Road. You continue driving straight up the mountain till you come to a circle at the top. Continue round the circle and drive down Camps Bay drive, which is a long winding road going down towards the sea. You will pass the Hussar Grill on your left. Continuing towards the sea, cross over 3-way stop street at Houghton Road - Veterinary Clinic on your right - Take first right into First Crescent. DRIVE SLOWLY AS IMMEDIATELY - WITHIN 20 METERS - you will need to turn sharp right into cul-de-sac ( at no 23 ) on your right hand side. 62227 page views since 03 Aug, 2005. Last updated on 18 Apr, 2019.